Down syndrome is a common cause of mental retardation in pediatric population. These individuals also have increased prevalence of both endocrine and nonendocrine autoimmune disorders with thyroid disorder being the most common endocrine disorder reported. Autoimmune disorders in these patients are associated with early presentation. Hypothyroidism is the most common autoimmune thyroid disease while Graves' disease is rare in patients of Down syndrome. We hereby present a case of Graves' disease in a patient with Down syndrome that clinically presented with symptoms of hyperthyroidism. Early definitive treatment is recommended in view of challenges of compliance to treatment in these mentally challenged individuals. With the incidence of 1:800, Down syndrome is the most common chromosomal anomaly that is compatible with life. Lifetime prevalence of thyroid disorder among patients with Down syndrome is 28 times more than the general population. Hypothyroidism is more often seen than hyperthyroidism. Although rare, Graves' disease is still the most common cause of hyperthyroidism in patients with Down syndrome with 6.5% greater prevalence than in general population. Commonly, patients with Graves' disease present with symptoms of hyperthyroidism, for example, fatigue, heat intolerance, weight loss, increased appetite, diarrhea, palpitation, irritability, and restlessness. Hyperthyroidism is linked to exaggerated production of thyroid-stimulating antibodies and worsening of the disease and can lead to osteoporosis, psychomotor abnormalities, and heart disease in children. Here, we present a case of Down syndrome that presented with associated Graves' disease rather than hypothyroidism and discuss management issues of this rare association. Written informed consent was obtained from guardian of the patient. 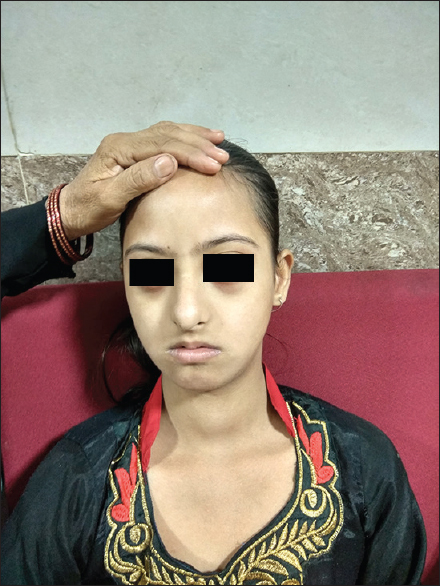 A 12-year-old girl presented to the endocrinology outpatient department with her mother for consultation of swelling in the neck [Figure 1]. She also complained of diarrhea and severe weight loss. 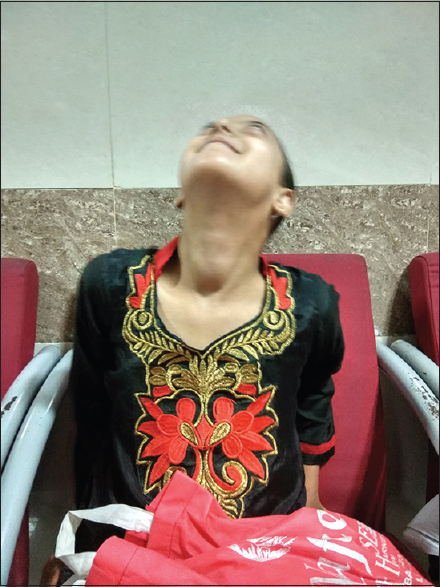 On local examination, a diffuse anterior neck swelling of size 15 cm × 6 cm which moved on deglutition was observed [Figure 2]. On general examination, the patient had tachycardia, mild proptosis, warm and moist hands along with fine tremors, and Tanner Stage 1. The patient also had intellectual disability, epicanthal folds of the eyelid, mongoloid slant, sandal gap [Figure 3], and history of delayed developmental milestones. Vocal comprehension was impaired. Her weight and height were 26.7 kg and 135 cm, respectively, with body mass index of 14.6 kg/m2. On the basis of history and examination, provisional diagnosis of Graves' disease with Down syndrome was made and confirmed with thyroid function test, thyroid scan, and karyotyping. The patient's initial thyroid levels were as follows: thyroid-stimulating hormone (TSH) – 0.01 μiU/ml, T4 – 35 μg/dl, and T3 – 6.73 ng/ml. Thyroid scan showed homogeneous increased uptake of radiotracer and faint visualization of salivary glands. Echocardiogram showed no abnormalities. Karyotyping showed trisomy 21. Blood glucose levels were normal. Liver function test and neutrophil counts were within normal range. The patient was started on 15-mg methimazole and 40-mg propranolol daily. After 2 months, clinical symptoms improved significantly, size of neck swelling decreased, and diarrhea subsided. On follow-up, thyroid levels improved to TSH <0.01 μiU/ml, T4 – 27.6 μg/dl, and T3 – 5.06 ng/ml. the patient's mother was counseled about the importance of medicine compliance and reports early in case of symptoms suggestive of agranulocytosis. In view of difficulty in managing the child, option of radioiodine therapy and surgery was given for permanent cure from hyperthyroidism and easier treatment. Clinical presentation of Graves' disease in patients with Down syndrome is similar to that in general population, except few peculiarities such as earlier presentation, no gender predominance, less severe clinical course, decreased prevalence of ophthalmopathy, more frequent association with other autoimmune diseases, and decreased rate of remission. Radioactive iodine ablation (RAIA)-I-131 and total thyroidectomy are the definitive treatment options available for Graves' disease with antithyroid drugs (ATD) being given initially for treatment. The treatment is no different in a patient of Down syndrome. Our patient was initially put on methimazole and dosing adjusted on follow-up. One of the largest studies of 1105 cases with Down syndrome showed thyroid pathology in 216 patients (19.5%). About 168 cases had subclinical hypothyroidism, 24 had clinical primary hypothyroidism, 15 had congenital hypothyroidism, and only 5 had hyperthyroidism. Another study from Spain in 1832 Down syndrome patients of which only 12 patients had hyperthyroidism. Radioactive iodine was used in their series. The prevalence of hyperthyroidism in patients of Down syndrome is around 3%,, which is higher than that in general population. Patients with Down syndrome have a higher incidence of autoimmune disorder, especially autoimmune thyroid disease. Hypothyroidism is the predominant thyroid disease with prevalence of 20%–50% in Down syndrome patients. There is no female preponderance of Graves' disease in Down syndrome patients as seen in general population. Besides autoimmune thyroid disease, type 1 diabetes mellitus and celiac disease are seen more frequently in Down syndrome than in general population. Role of thyroid surgery in Down syndrome patients is limited, and RAIA is preferred as definite therapy. Patients of Down syndrome may have certain facial anomalies giving rise to airway obstruction and difficult anesthesia. With long duration of treatment using ATD and difficulty in insuring compliance in these mentally challenged children, early definitive therapy in the form of RAIA is a better alternative. There is increased prevalence of autoimmune diseases in Down syndrome, mainly hypothyroidism. The association of Graves' disease with Down syndrome is rare. While initial management is almost always with ATD, choice of definitive treatment between RAIA and surgery is a matter of individual preference. RAIA is preferred over surgery in patients of Down syndrome. Hyperthyroidism is difficult to manage in these children with mental retardation, and early definitive therapy is thus indicated. Radetti G, Drei F, Betterle C, Mengarda G. Down's syndrome, hypothyroidism and insulin-dependent diabetes mellitus. Helv Paediatr Acta 1986;41:377-80. Pierce MJ, LaFranchi SH, Pinter JD. Characterization of thyroid abnormalities in a large cohort of children with Down syndrome. Horm Res Paediatr 2017;87:170-8. Popova G, Paterson WF, Brown A, Donaldson MD. Hashimoto's thyroiditis in Down's syndrome: Clinical presentation and evolution. Horm Res 2008;70:278-84. Nayak B, Burman K. Thyrotoxicosis and thyroid storm. Endocrinol Metab Clin 2006;35:663-86. Saxena KM, Crawford JD, Talbot NB. Childhood thyrotoxicosis: A long-term perspective. Br Med J 1964;2:1153-8. Aversa T, Lombardo F, Valenzise M, Messina MF, Sferlazzas C, Salzano G, et al. Peculiarities of autoimmune thyroid diseases in children with turner or Down syndrome: An overview. Ital J Pediatr 2015;41:39. Regueras L, Prieto P, Muñoz-Calvo MT, Pozo J, Arguinzoniz L, Argente J, et al. Endocrinological abnormalities in 1,105 children and adolescents with down syndrome. Med Clin (Barc) 2011;136:376-81. Goday-Arno A, Cerda-Esteva M, Flores-Le-Roux JA, Chillaron-Jordan JJ, Corretger JM, Cano-Pérez JF, et al. Hyperthyroidism in a population with Down syndrome (DS). Clin Endocrinol (Oxf) 2009;71:110-4. Fort P, Lifshitz F, Bellisario R, Davis J, Lanes R, Pugliese M, et al. Abnormalities of thyroid function in infants with Down syndrome. J Pediatr 1984;104:545-9. Prasher VP. Down syndrome and thyroid disorders: A review. Downs Syndr Res Pract 1999;6:25-42.